Day Therapy Manager at St Clare Hospice, Emily Stowe, explains the benefits of keeping active and the vital role that physiotherapy plays in the hospice setting. Emily shares her inspiring experiences and helpful tips, alongside her top 5 reasons why keeping active can change your life! My name is Emily Stowe, and I am the Day Therapy Manager at St Clare Hospice. I manage all of our Day Therapy groups here at the hospice. They offer support to local people living with a life-limiting illness right from the point of receiving a palliative diagnosis. Physiotherapy plays a vital role in the hospice setting. However, it is not always the first place you think of when you imagine this kind of therapy. The truth is that keeping active really can change your life. No matter who you are, or what your circumstances are. I have witnessed the incredible effects that physical activity can have on a person. Whether it strengthens somebody’s physical capabilities, improves their mental well-being or maintains an individual’s independence – or more commonly, all three! Most people usually associate physiotherapy with sports injuries or recovery after something like a serious stroke, however, the role of a physiotherapist can be much wider than this. In fact, there are around 55,000 qualified physiotherapists in the UK seeing people (and animals!) in a huge range of settings! Physiotherapy helps restore or maintain movement or function when someone is affected by injury, illness or disability. Physiotherapists usually do this through movement and exercise, manual therapy, education and advice. We take a “holistic” approach – taking the whole person into account. The role of the physiotherapist in the hospice setting could not be more vital. I decided to become a physiotherapist after seeing a Paralympic athlete, who was also a physiotherapist, speak about his life when I was at school. I have to admit I turned up at university for my first day of training with a very limited understanding of what the next 3 years of my degree would bring! Luckily, I enjoyed the surprises it provided! I left university with a good idea of the areas of physiotherapy I did not want to work in. However, I only had vague ideas about where my career would take me. I certainly wouldn’t have believed you if you told me I would be working in palliative care! Initially, I worked in private practice, mainly treating the bad backs, sports injuries and work related injuries (known as musculoskeletal physiotherapy) that people would expect from a physiotherapist. I was also doing some work with people in their own homes, mainly who had neurological conditions like strokes or multiple sclerosis. I knew my heart didn’t lie with musculoskeletal physiotherapy and that I wanted to return to the NHS work that I had done as a student. So, when I saw the job advertised at St Clare Hospice for a part time physiotherapist, I applied, thinking that I would stay for 6 months as a route back into the NHS. That was 9 years ago and I’ve been here ever since! What is physiotherapy in a hospice setting? I wasn’t really sure initially what my role at the hospice would be. I had the same impression of hospices that many people do: that they were for people very near to the end of their lives. All of my training had been focused on helping people to recover from illness back to full-function, and I wasn’t sure how physiotherapy fitted into a palliative care setting. Within days of starting at the hospice, I realised that my perceptions of hospice care had been wrong. I saw many people who were actively living with their diseases, who wanted to improve their quality of life as much as was possible within their limitations. So, I started to understand how my physiotherapy skills could assist people in achieving this! I was inspired by the fact that I had scope to think ‘outside the box’ to help people to work towards their goals in a way that was meaningful for them. One particular lady who really helped me to understand the benefits of physiotherapy in palliative care, quite early on in my time at the Hospice, was called Maud. Maud had been sent home from hospital to spend her last few weeks in a hospital bed in her front room, being looked after in bed and not getting out at all. However, she had outdone everyone’s expectations and some months later, I went out to see her at home. Despite having not been out of bed for 3 months, at my first visit she managed to stand up with the assistance of a frame. Over the next few weeks she kept improving and got to a stage where she was walking around 200 yards with 2 sticks. This re-opened the world to her. From being stuck in one room, she was able to go out for meals with her family, attend Day Therapy at the hospice and visit friends. The improvement physiotherapy had made to her quality of life was incredible. How can physiotherapy help people with a life limiting illness? Physiotherapy’s main purpose is to support people to achieve their own personal goals. We aim to empower people to take some control back, develop their self-confidence and learn to manage their own conditions. This is termed “Rehabilitative Palliative Care” and describes an approach we take with all of our patients. For some people, their goal may be improving their fitness so they can continue countryside walks. For others, it may be improving their breathlessness so they can return to picking up their children or grandchildren from school. Some people’s individual goals may be smaller, like improving strength enough to be able to apply their own make-up, or managing their pain better so they can sit out in their chair for a day to complete a cross-stitch. Physiotherapists work with the whole multi-disciplinary team, but work particularly closely with Occupational Therapists as they can often bring different sets of skills to help someone achieve the same goal. Sometimes, we work with people with advanced disease. So then, our work is in supporting people to come to terms with their current physical ability. We look at how best to manage with their symptoms to enable them to maintain as much independence as is possible for them. 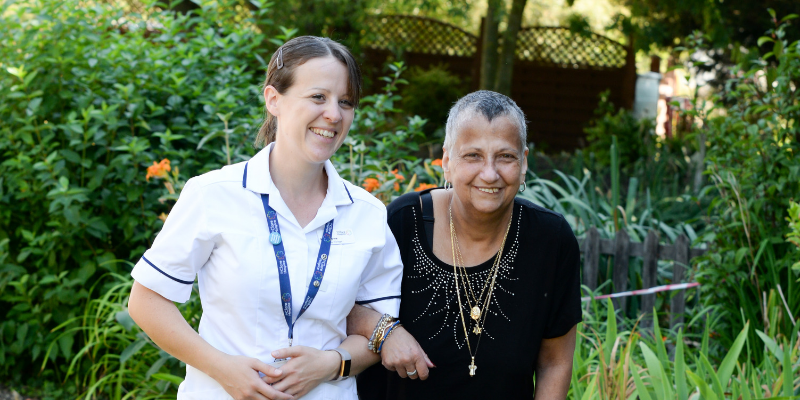 In a hospice setting, we work with people with any life limiting condition and are commonly involved with people with neurological, respiratory and heart conditions, as well as those with cancer. We also see people in whichever setting is best for them. Whether that be when they are inpatients at the hospice, when they are attending for groups in Day Therapy or in their own homes. I really enjoy the variety my work at the hospice brings. No two days are the same and I am constantly challenged by new situations. Our physiotherapists at St Clare also run two groups: the Physiotherapy Exercise Group and the Breathlessness Group. The Physiotherapy Exercise Group is designed to encourage people to do more exercise in a safe and supportive environment, where they know the exercise is tailored to their needs. The Breathlessness Group offers advice and support to people living with breathlessness, as well as the opportunity to speak to others living with similar conditions. So why do we need to keep active? The Chartered Society of Physiotherapy is the professional body for physiotherapists in the UK. This year, they have a launched a campaign called ‘Love Activity, Hate Exercise’. It aims to get the nation more active. Even for those who don’t like traditional ‘exercise’ types like team sports or going to a gym! Being active has huge benefits for all of us, including those with and without health conditions. Increasingly, we are seeing that being active has enormous benefits for everyone’s physical and mental health. We all just need to find a way of being active that we enjoy and can maintain. Being active reduces your risk of certain conditions, including some cancers, heart conditions, arthritis, and stroke. Anyone can gain these benefits at any age so its never too late to start. Studies show we lose 3-5% of muscle every year from the age of 30 if we don’t take steps to maintain it. This means that by the time we reach older age, we may need help with basic tasks such as cleaning our homes or having a bath. Being active can improve your energy levels. This might sound counter-intuitive, but if you are generally fitter, you will find you have more energy for your normal day to day activities and will be less tired by something simple like going to the shops. Being active improves your concentration and productivity, as well as reducing the risk of dementia later in life. Studies have shown exercise improves recall of facts and helps us to focus on the task at hand. For older people, being active reduces the risk of falls. Falls are the number one cause of admission to hospital for older people. However, specific activities to improve strength and balance can help to reduce someone’s risk of falls. Being active can include simple activities. For example, walking the dog, scrubbing the car clean or digging in the garden. It doesn’t have to mean going down to the gym and pumping iron! We would always recommend getting advice from a medical professional, usually your GP or a physiotherapist, before starting an activity programme if you haven’t done any before, particularly if you have a long term health condition. Your GP can refer you to a physiotherapist for advice on getting active if you have a health condition for which may need more specific guidance. Find someone to join you – that way you can motivate each other if one of you starts to flag! You might ache to start with, this is quite normal, but if pain persists ease back and seek some advice. At St Clare Hospice, we promote activity to all our patients. We do this in a way that is suitable for them given their physical, social and emotional needs. Activity can also be really valuable, both physically and psychologically for carers who are living with the physical and emotional strains of looking after a loved one. Emily has been qualified as a physiotherapist for 11 years and working at St Clare Hospice for 9 years, initially as a physiotherapist and now in her role as Day Therapy Manager. She is chair of the Association of Chartered Physiotherapists in Oncology and Palliative Care, representing physiotherapists across the UK working in these fields.